Starring Kevin Jonas, Joe Jonas, Nick Jonas, "Big Rob" Feggans, Demi Lovato, Taylor Swift, John Lloyd Taylor, John Cahill Lawless, Ryan Matthew Liestman, Gregory Robert Garbowsky, Caitlin Evanson, Ben Clark, Denise Jonas and Kevin Jonas, Sr. Distributed by Walt Disney Pictures. 76 minutes. Rated G.
In The 3D Concert Experience � the Jonas Brothers try their best to remake the Beatles� A Hard Day�s Night. Yes, I realize that just by making that statement I expose myself as being totally out of the Jonas� target demographic � and surely out of touch with them as well, some will say � however, a fact is a fact. It�s a look at the crazy life of a pop star, from the sweet hotels to the throngs of screaming girls. Of course A Hard Day�s Night was a somewhat fictional look at a pop phenomenon, while the JoBros film is real � or at least as real as a tightly choreographed look at the group from the Disney marketing arm will allow. Then again real is so subjective in the new world. This is every bit as real as Survivor or Jon & Kate Plus Eight � a tightly planned and controlled look at people pretending not to be aware that their every move is being caught on camera. Do I think the Jonas Brothers really act like this in everyday life? Hell, no. It doesn�t really matter though. The Concert Experience is a piece of product � just like a t-shirt or a program or a poster � to commemorate a rock tour. 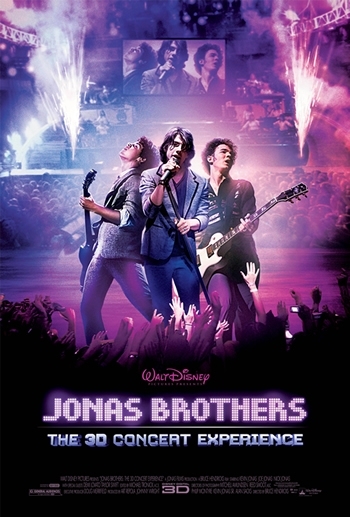 However, for a product, the nice surprise is that Jonas Brothers: The Concert Experience isn�t half bad. There is no real reason why this should have been released in theaters, which it was briefly to try to cash in on the surprise popularity of Miley Cyrus� similar Best of Both Worlds Concert a year ago. That said, JB:TCE fits just fine in the genre where it belongs � concert videos. Personally, I prefer a little less offstage fooling around in my live vids � but I have no doubt that the young girls this movie is aimed at will eat the hi-jinx up with a spoon. The best thing is, though, as prefab pop bands go, the Jonas Brothers are actually rather talented. I wouldn�t want to live on a steady diet of their music, but listening to it periodically, the tunes go down nice and easy. Strangely, though, the one JoBros song that I personally know well � �When You Look Me in the Eyes� � does not make the cut, despite the fact that it is one of their biggest hits. I assume it was glossed over because the guys already performed the song in the Miley Cyrus tour movie. When the film isn�t looking at the music, it is less interesting. The rest of the circus going on around them includes a �fake� group of Jonases there to work the crowds (don�t third world dictators do that?) and mock middle-aged Spanish tourists, brief duet performances by teen queens Demi Lovato and Taylor Swift, a rather nice travel video on New York (showing Times Square, Central Park, etc.) and thousands of crying, screaming, prepubescent girls. The only other guy who gets significant airtime is Big Rob, who seems to be their tour manager/bodyguard � though he doesn�t seem to be very good at either position. (To add to the confusion about his position on the tour, he also does a guest rap on the hit �Burning Up.�) In an early, obviously choreographed scene, they are stuck in downtown New York traffic when their SUV is attacked by hundreds of screaming girls. Big Rob leaves the guys to their own devices, allowing his charges to be chased by screaming teeny-boppers alone, hoping they will make it to a waiting helicopter to do a morning show. As a bodyguard, he should never leave the people he is in charge of protecting in such a dangerous position. As a tour manager he should never leave it up to fate whether his band will make it to a TV commitment. Either way, he would be fired if it weren�t such a transparent fake. Also, the movie was released in 3D � and watching it on DVD in 2D, you are all too aware of all the shots of people throwing things towards the camera � a move that is made completely moot without the silly glasses. Still, if you are a fan of the Jonas Brothers, you will love The Concert Experience. If you don�t, this may not totally change your mind, but at least you have to give a little grudging respect to the guys. They are not merely prefab teen idols � they do have some talent, too. Copyright �2009 PopEntertainment.com. All rights reserved. Posted: June 30, 2009.